Machinerie G.A.S. has acquired a wide expertise in production of dies that are adaptable to several shears and press brakes, as well as to the GINGRAS combined shear/press brake. 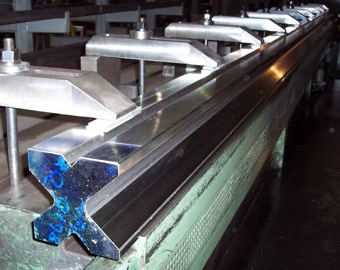 The dies are custom-made to your specifications, and quickly delivered. Machinerie G.A.S.’s technical team uses advanced 2D and 3D software to properly read your files and manufacture dies to your specific needs. The dies can also be manufactured with the same precision from your free-hand drawings. Machinerie G.A.S. can manufacture dies of all sizes up to 6 m (20 ft), compatible with all types of press brakes.